In April 1939, Bob Kane (and Bill Finger) published the first story about The Bat-Man in Detective Comics #27, bringing DC what would be its second big hit. Certainly his dramatic appearance had something to do with the character’s success, but I thought the first story was interesting by keeping him mysterious: He was not given an origin story, he spoke very little, the reader wasn’t given any insight into his thoughts, and his identity of Bruce Wayne, young socialite, was kept “secret” until the last panel. 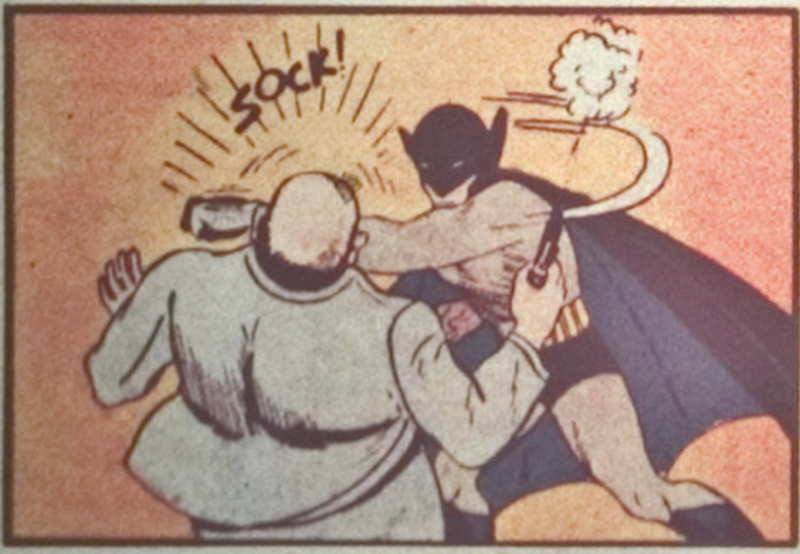 Yep, Bat-Man mostly spoke with his fists, though he was not the first to use onomatopoeia in his fight scenes.